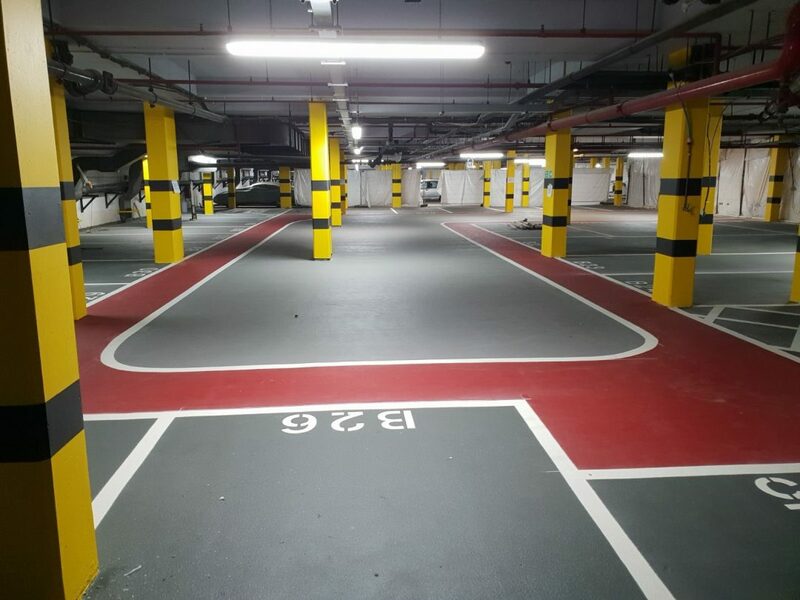 Thelwell Flooring recently completed a refurbishment of a 5000m2 car parking complex in Kensington, London whilst maintaining operational car parking facilities throughout the project. The existing structure of this car park in Kensington, London was tired and deteriorated. Before re-surfacing work could begin we carried out numerous patch repairs to the old surface to ensure we could provide a seamless, smooth running surface. We completely refurbished the existing car park to make it brighter and to clearly differentiate driving, parking and walking aisles. After the old tarmac was removed via planing machines, the existing concrete floor was mechanically prepared extensively by shot blasting the surface clean and to produce a course profile. We then inspected the concrete deck for required concrete repairs in each section prior to laying the new surface. A key requirement of this project was that the car park remained operational while the refurbishment was being carried out. To achieve this, the total floor space of circa 5000m2 was divided into 6 sections. This enabled us to co-ordinate the works and maintain the maximum number of available parking spaces possible. Speed was vital on this project. The Tremco MMA resin floor system was chosen for the new car park surface for its rapid curing technology allowing full vehicle traffic in as little as 2 hours. To ensure a crisp and concise finish to each phase we spray applied all the line markings to clearly define the coloured zones and to install arrows, symbols and crossing points. The Tremco MMA system we installed was chosen for its longevity and durability. The system is offered with a 10year warranty and meets British standards for slip resistance under wet and dry testing. This ensures a safe parking environment for vehicle and foot traffic in all weather conditions. Multiple colours were used to highlight drive lanes, parking spaces, walkways, cycle lanes, crossings or specific parking for disabled users or parent and child users. Matching symbols and markings are then spray applied directly to the finished coating system. Do you need new car park flooring? Contact Thelwell Flooring on 0151 200 1038 or fill out our online contact form and we’ll get back to you as soon as possible.